Food and Ready to Drink Beverage manufacturer, namely 100% fruit juice, apple cider, mixed fruit and vegetable juice,100% Tipco Pro-Fiber, 100% pasteurized fruit juice, Tipco Squeeze, 40% Tipco fruit juice concentrate under the brand Tipco Cool, Aura Mineral Water, Squeeze Bar and Tipco Homsuwan Pineapple. The company aims to research and develop products that have high quality and are good to the consumers’ health, as Tipco hopes Thai consumers would keep themselves healthy. Tipco has gained the biggest market share for 20 years and has received awards from many prominent organizations. It also exports to more than 30 countries worldwide. The benefit of becoming a T Mark member is that the membership helps boost consumers’ confidence locally and overseas. The membership also reminds Tipco F&B Company Limited to always maintain its manufacturing standards and the quality of its products. Tipco’s T Mark membership has started in March 2015 and will continue until March 2018. This is not like any ordinary fruit juice to quench your thirst or refresh you, but it also keeps you healthy. Other Tipco beverages do the same. They do not only taste good, but offer much more. As people’s daily lives have become ever more hectic, selecting any food or drink is oftentimes based on convenience in buying rather than quality. Yet how good would it be for a product to offer the same convenience without compromising your health? 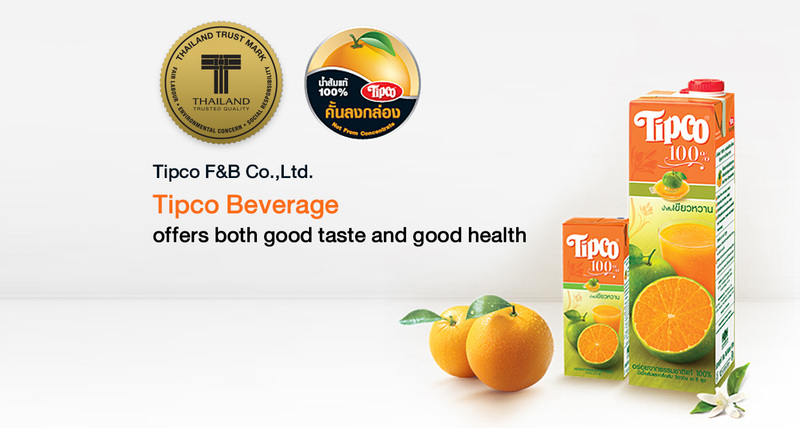 Tipco F&B Company is under Tipco Foods Public Company Limited, a leader in ready to drink beverages in Thailand for more than 20 years. Besides its 100% fruit juice, Tipco has added other products to its product line, including fruit and vegetable mix juice, pasteurized juice, traditional Chinese Oolong tea, Aura mineral water, as well as fruit juice bar like Squeeze ,which offers top quality fruit beverages for all genders and ages. Tipco’s strong determination and commitment have enabled the company to become a leader in Thailand’s beverage sector. Tipco now has the largest market share in the Thai beverage sector. Every Tipco product is unique, whether it is the 100% fruit juice, which has vitamins and minerals that come with the fresh fruits, the 100% pasteurized fruit juice called Tipco Squeeze or the 40% Tipco fruit juice called Tipco Cool. All these products give consumers the freshness that comes with real fruits. Its mineral water, Aura, also originates from the only cool natural spring water in Thailand. This mineral water is known for its purity. Consumers can also benefit greatly from the minerals that come with the water. Under the slogan “Bring Wellness to Society”, Tipco has extended its funds for research and development in various areas. This includes continually coming up with new products and marketing strategies. Additionally, Tipco also tries to convince consumers that taking care of one’s health on a regular basis can be fun and easy. Besides its local market, Tipco has sold products in more than 30 countries, where there have always been positive feedbacks from its overseas markets. Its sales volume has continuously risen. The beverage manufacturer also hopes Tipco will make Thailand known in the international food and beverage arena. Hence, this can help other Thai brands gain credibility internationally. Being number one is not easy, yet it is even tougher to maintain that position. 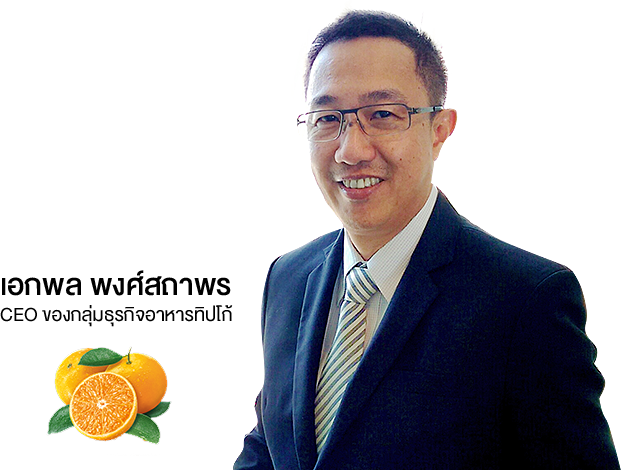 Surely, it has not been an easy journey to become a leader in the beverage sector in Thailand. It would not have been possible without several factors, making it hard for competitors to substitute. The factors include ensuring a high product quality, starting from the selection of ingredients, the manufacturing process, quality control, and customer service. For example, Tipco manufactures 100% pure orange juice, the only brand that makes juice from fresh oranges and not simply orange juice concentrate. Consumers in turn get more benefits, not to mention, the unique taste that no other fruit juice manufacturer can offer. Before Tipco launches a new product, it would make a thorough study and research of the target market to fully understand the needs and lifestyles of the consumers. Tipco F&B has definite goals and keeps to its manufacturing standards, making its brand strong. Its past awards guarantee its high quality. Tipco received the Super Brand Thailand Choice 2014-2015 Award from Superbrands, an independent and international organization. In 2014, it also received an award for being the strongest and most powerful brand in Thailand for the fruit beverage category. The award was given by Chulalongkorn University.It also earned from Reader’s Digest the Trusted Brand Award between 2005 and 2007. In 2011, Tipco won the Best Logistics Management Award from the Industrial Ministry’s Department of Primary Industries and Mines. Additionally, its Thailand Trust Mark also helped to earn trust from consumers locally and overseas. The past awards serve as simple reminders for Tipco F&B Company to maintain its high manufacturing standard and product quality, as well as keeping regular communication with its consumers. The benefit of becoming a T Mark member is that the membership helps boost consumers’ confidence locally and overseas. The membership also reminds Tipco F&B Company Limited to always maintain its manufacturing standards and the quality of its products.